Getting up early in the morning, driving to a location with a good western view, and then standing around for many hours taking photos of the lunar eclipse. Yes, it was worth it. But I was very cold by the time it was over. 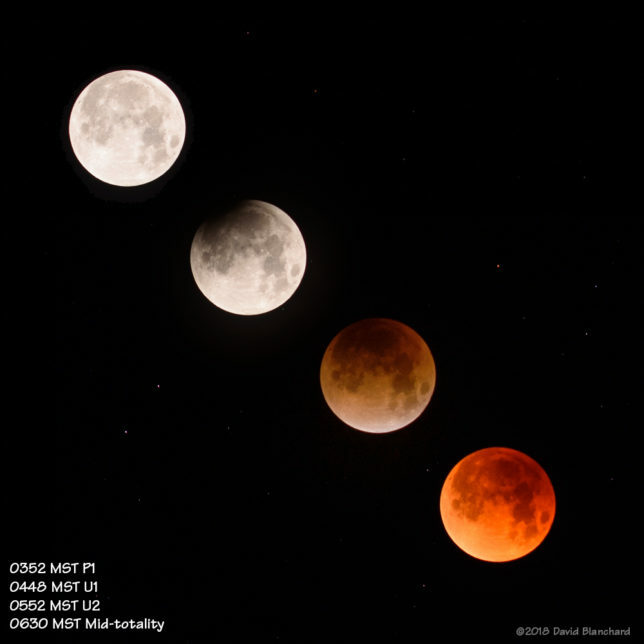 Four stages of the total lunar eclipse of 31 January 2018. This lunar eclipse has been referred to as the “Super Blue Blood Moon” eclipse. What does that even mean? Okay—here is an informative article written by an astronomer on how these terms came to be part of our jargon for this eclipse. 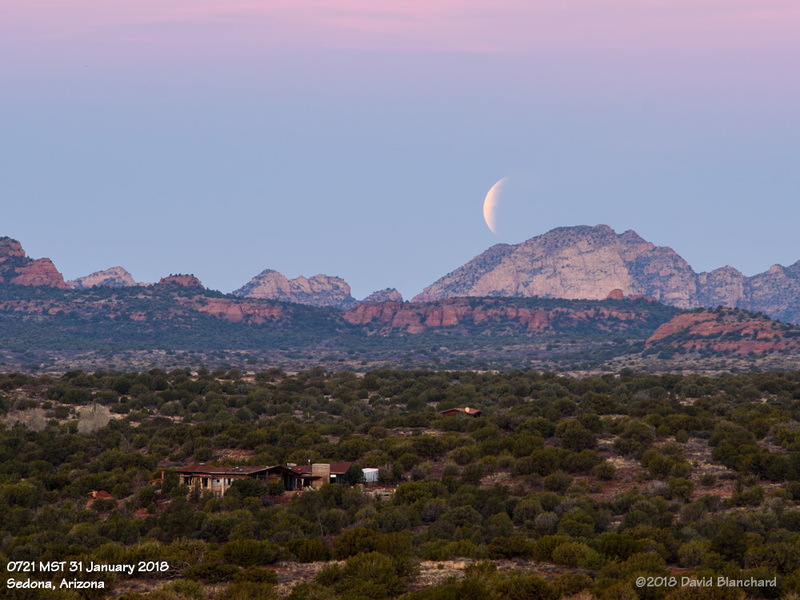 I had considered many possibilities how to photograph the lunar eclipse including interesting foregrounds, multiple exposures, and even video. 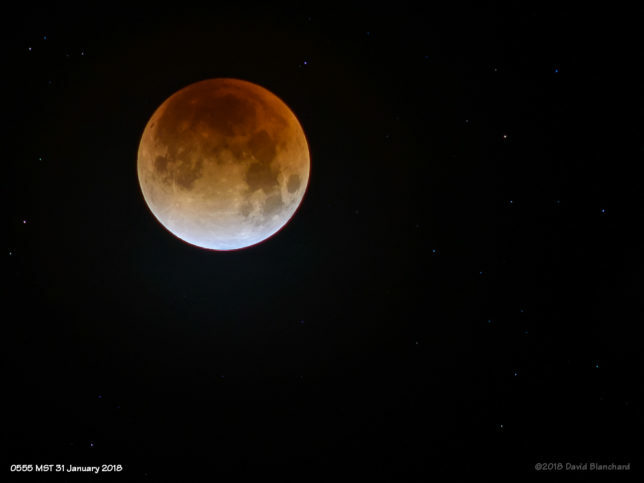 Some examples of single and multiple images can be found in this blog for 2014 and 2015 eclipses taken during the recent Lunar Eclipse Tetrad of 2014-2015. A tetrad is a series of four consecutive total eclipses occurring at approximately six month intervals. It’s now been a bit more than two years since the last lunar eclipse visible around here and I was ready for another. Eventually I decided to try something a bit different from previous events. I would mount the camera on the iOptron SkyTracker so that the camera would follow the stars. From these images, I would construct a time-lapse of the eclipse as it went through its different phases. With the SkyTracker, the stars would remain fixed while the moon would slowly move across the sky relative to the stars—and the Earth’s shadow. It worked pretty well but I did manage to bump the camera a few times as I was changing exposure settings. I had considered using a phone application that could change the settings on the camera so I would not have to touch it—but the power drain when WiFi was active was unacceptable. I would probably need to change the battery during the eclipse—which put me right back in the same situation of jostling the camera. Okay—just keep it simple. No WiFi, adjust by hand, and be careful. The image at the top of this entry is a composite of four stages of the eclipse. P1 is the first stage when the Moon enters the Penumbral shadow of the Earth. Only a subtle darkening occurs during this stage. U1 occurs when the Moon first enters the umbral shadow and the darkening along one edge is very distinct. U2 is the beginning of totality. Mid-totality is the darkest stage of the eclipse. This can be seen as a turquoise-blue fringe around the red. And here we have an image taken just a few minutes after totality began that shows some blue along the lower limb. A few minutes after totality ended—and a few minutes before moonset. Stages P1, U1, U2, and mid-totality were all visible with a very dark sky. U3 (end of totality) occurred during morning twilight; U4 and P2 both occurred after Moonset. The time-lapse sequence was shot with 3-minute intervals. This is a good interval if you want to composite images as the moon has moved a full diameter plus a bit more in three minutes so that individual frames do not overlap. Three minutes, however, is too long a time for a smooth time lapse. Lesson learned for the next event! The animation of the eclipse starts at P1 and ends just as the moon sets. The exposure was changed during totality and stars become visible. Later, twilight brightens the entire sky and, at the end, the distant mountains can be seen as the moon sets in the west. The next total Lunar Eclipse will occur 27 July 2018 but will not be visible from any part of North America. 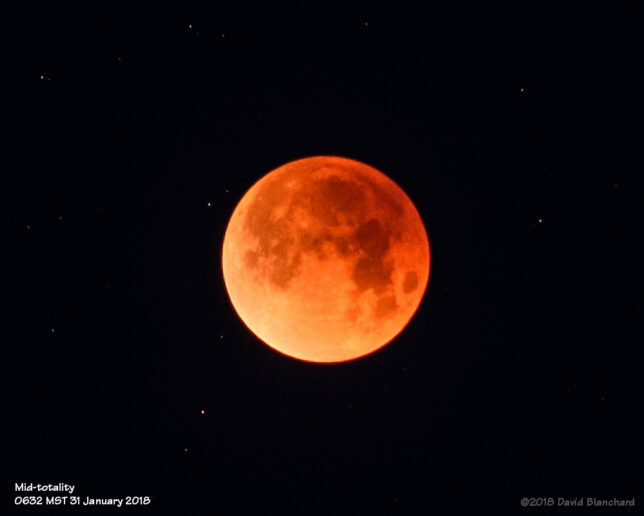 The next North American total lunar eclipse will occur on 21 January 2019.